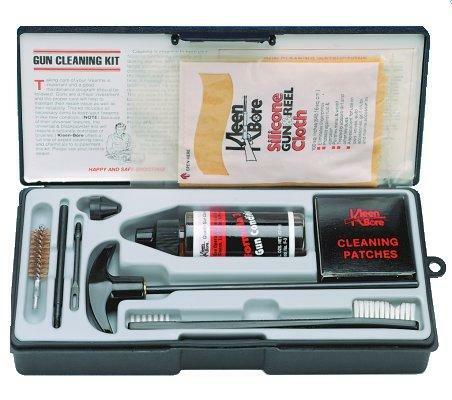 Classic Handgun Cleaning Kits include two working rod sections, both of which are threaded to accept all standard accessories. The swivel handle section will clean up to a 7" barrel, and with the 2 3/4" rod extension, handle up to a 10" barrel handgun. Handgun Cleaning Kits. Steel 10" rod with swivel handle. Accessory adapters. Double-ended nylon bristle gun brush. Phosphor bronze bore brush. Slotted patch holder. 2 oz. Formula 3 Gun Conditioner. 100% Cotton cleaning patches. Silicone gun and reel cloth.